• Henry Wilson Coil Lecturer Dr. Margaret C. Jacob, Masonic scholar and Professor of History at UCLA, whose research of Freemasonry during the Enlightenment links Masonic principles to the founding of democratic society. • R. Stephen Doan, Past Grand Master of Masons in California, who will discuss contemporary society's major divisions, their causes and effects. 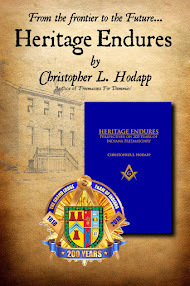 • John L. Cooper III, Past Grand Secretary of the Grand Lodge of California, who lends insight into which Masonic principles are necessary for a healthy democracy, and how to manage society's divisions while remaining true to Masonry's tenets of nonpartisanship and secularism. I'm a little late in posting this, but the registration form is here. A good friend and brother has long maintained that all Freemasonry is local. This story certainly illustrates that contention. The brethren of the Prince Hall lodges in Chesterfield County, South Carolina pulled together this past week and held a fund raising "plate sale" to help a local resident suffering from cancer. A story in today's Cheraw Chronicle reports that Sanctorium Lodge #25, St. David’s Lodge #467, and Davis Temple Lodge No. 481 donated proceeds from a joint event to defray medical bills. McMillon says that being a part of the community is what the Masonic Lodges strives to do. A Note About "The Blue Lodge Forum"
It is my understanding that The Blue Lodge Forum has recently announced that it is an official site of the Grand Orient of the USA (GOofUSA). 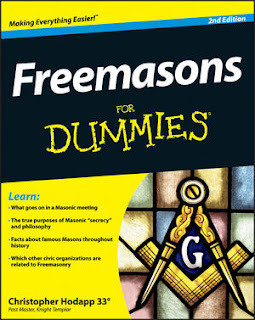 I have been told that the Blue Lodge Forum reformats and reposts all entries from this blog, "Freemasons For Dummies." I do not in any way way, shape or form support the GOofUSA. While I completely disagree with the formation of a schismatic Masonic organization, I wish those involved in that group no ill will. But I do not want anyone to have the impression that the unauthorized appearance of my blog entries on The Blue Lodge Forum website somehow implies my approval or agreement with their goals. I have asked that they cease and desist this practice and remove all previous entries taken from my blog and reposted on their site. The Scottish Rite Valley of Chicago has announced the finalization of plans for their new headquarters in Bloomingdale, Illinois. Building Design and Construction magazine features an article about the new building on its website. According to the story, construction will be completed by next year. The 62,000 square foot facility will include a 250 seat auditorium, a 90-seat lodge hall, dining room, bar, game room, library, museum, learning center, offices, and a board room. 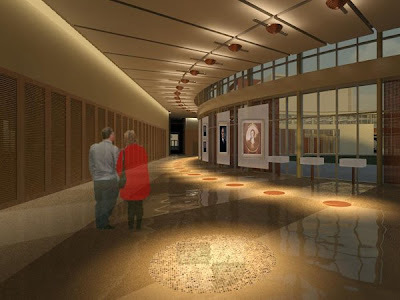 A two-story gallery will feature embossed copper medallions embedded in the floor, symbolizing the 33 degrees. The Legat Architects website features more renderings of the design. The Valley's executive secretary is quoted in the article as saying, “The new headquarters of the Scottish Rite Valley of Chicago will be a stupendous monument of architecture." It is perhaps worth looking at the building they moved out of in 1996. 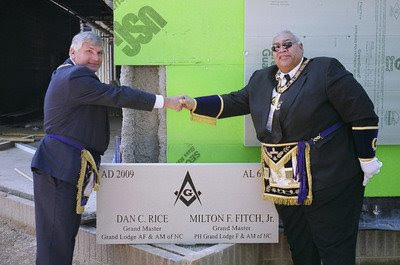 According to a message by Brother William Mills of the GLofNC, "the purpose of the meeting was to lay a cornerstone for the new Richmond County Courthouse in Rockingham. For purposes of conducting the ceremony the Grand Masters appointed the officers of of Day Spring Lodge #44 F & AM and Rockingham Lodge to serve as pro tempore as Grand Lodge officers. The Masters of both lodges were appointed pro tempore Grand Master and the other officers were appointed on an alternating basis from the two local lodges." Not just a cornerstone. A new milestone. I had a great time at Advance Lodge in Queens yesterday at Quest XXIX. Many thanks to Jay and all of the brethren there for their kind hospitality and their warm welcome. And I thoroughly enjoyed Richard Eberle's presentation on the Templars and the GL of New York's acquisition of the Vatican's reprint of the Chinon Parchment. 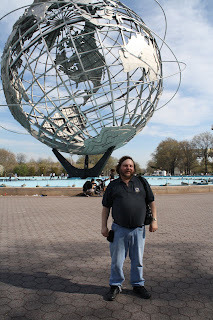 I spent the afternoon over at Flushing Meadows Corona Park looking for my lost youth—the site of the 1964 Word's Fair. I was last there when I was 6. Apart from the incredible Unisphere built for the fair, and the crumbling New York Pavilion (destroyed in the end of Men In Black), the Atlas and Titan rockets at the Hall of Science, along with the acres of non-functioning fountains, there is not much to recognize from my day at the Fair. The Terrace restaurant overlooking the park is also still there. I recall that it had a heliport on the roof, back in the days when Pan Am operated helicopter service from their roof in Manhattan. Life was so much more futuristic in 1964. But the intrepid Mason will find the statue of George Washington in Masonic regalia, erected by the Masons of New York and appropriately surrounded by blossoming cherry trees. 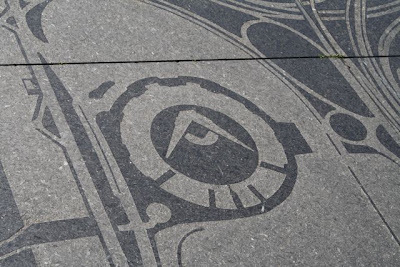 And in the stylized tile map of the fairgrounds that still exists to the east of the Unisphere, good eyes will spot the square and compasses. 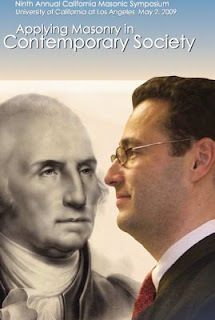 New D.C. Affinity Lodge for George Washington University: "The Colonial Lodge"
Ken Gibala reports from Washington DC that the Grand Lodge of the District of Columbia has granted dispensation for a new affinity lodge for students, faculty, staff and alumni of George Washington University. "The Colonial Lodge U.D." will meet adjacent to the university and will stress continuing Masonic education and philosophy. It is described as similar to W. L. Wilmshurst's famous "Lodge of Living Stones No. 4957", founded in Leeds, England in 1927, which stresses spirituality, education, and an academic approach to Masonic scholarship. The National Heritage Museum announces a call for papers for its first biannual symposium, “New Perspectives on American Freemasonry and Fraternalism,” to be held on Friday, April 9, 2010 at the Museum in Lexington, Massachusetts. The National Heritage Museum is an American history museum founded and supported by Scottish Rite Freemasons in the Northern Masonic Jurisdiction of the United States. As the repository of the largest collection of American Masonic and fraternal objects, books and manuscripts in the United States, the Museum aims to foster new research on American fraternalism and to encourage the use of its scholarly resources. Send proposals to: Aimee E. Newell, Senior Curator of Collections, National Heritage Museum, by email at anewell@monh.org or by mail to 33 Marrett Road, Lexington, MA 02421. Deadline for proposals to be received is August 15, 2009. For more information about the National Heritage Museum, see www.nationalheritagemuseum.org. For questions, contact Aimee E. Newell as above, or call 781-457-4144. Dan Brown's new novel, the sequel to The Da Vinci Code, now called The Lost Symbol, is due in stores September 15th. The publishing world heaves a sigh of relief. All those bookstores don't have to close now, and everybody can come back to work. The long-awaited novel – one of the most anticipated in recent publishing history - will be called "The Lost Symbol," and will take place over a 12-hour period. No more details were given about its content, but persistent rumours have suggested it will be set in Washington DC and will focus on freemasonry. It will be published on 15 September with an initial print run of 6.5 million copies – the largest first printing in publisher Random House's history. "This novel has been a strange and wonderful journey," said Brown. "Weaving five years of research into the story's 12-hour timeframe was an exhilarating challenge. Robert Langdon's life clearly moves a lot faster than mine." Undoubtedly, previous reports over the last six years that it was to be called "The Solomon Key", and the subsequent flooding of the market of similarly named books influenced a title change. And there are no details yet as to whether Brown will follow through on his long-announced plans for the book to involve Freemasonry. But we'll know in September. Random House has posted a new website at www.robertlandgon.com , the name of Brown's fictitious character, and it seems to point in a direction that is not Masonic. Yet, look carefully at the parchment puzzle on the site, and maybe it does. Brown's personal website at www.danbrown.com has also been updated today. Back from speaking at Columbine Lodge #147's "Colorado Night" at the Denver Consistory. So, when I landed at the Denver airport Friday and went to pick up my bags, I looked up, and I'm standing in front of the way creepy "soldier killing women with a sword" mural. WTF were they thinking here? 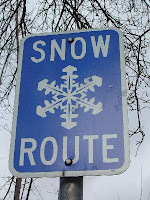 The snow was coming down by the wagonload, with sloppy wet flakes the size of sugar packets. I got off the car rental bus and walked ten feet, and was covered in glue-like snow. Thank God for National Car Rental's Emerald Aisle. Pay for a midsize car, but take anything on the lot. Let's see. $39 for the weekend for the Impala, or the Hummer H3. Hmmm. Hummer FTW! The snow stopped and had completely melted by Saturday afternoon, which was great for the Columbine event. Many thanks to WM Lance Rommerdahl, Grand Master Brian Cotter, their lovely ladies Robin and Jeanie, the members and officers of Columbine Lodge, and everyone who came out tonight. Over 100 folks were there, and it was a fantastic evening. It was great to meet new brethren and a few gentlemen interested in joining, as well. And a very big shout out to the Job's Daughters who served dinner. You girlz rock! All weekend long, the news has been doing retrospectives of the massacre at Columbine High School ten years ago. I hate that this is the image most people have of this community. I choose to think of Columbine, Colorado for the room filled with friends and brethren this evening, and the way they are making a difference in their community. A thousand thanks are not enough. Friend and brother Phillipe Benhamou (the co-author of the French version of Freemasons For Dummies, "La Franc-maçonnerie pour les Nuls") will be speaking with French authors Eric Giacometti ("La Croix Des Assassins") and Sophie Coignard ("A State Within A State") in a program called "Secret Society, or Discrete Society, or Freemasonry: Truths and Fantasies" in Paris. The event is hosted by the literary society Obsessed Textual on Wednesday April 29th, at the Hotel Lenox Montparnasse , 15 rue Delambre - 75014 Paris. Eric Giacometti, a non-Mason, is the co-author of La Croix des Assassins, part of a series of police procedural novels co-written with Freemason Jacques Ravenna. The four books feature a Masonic police commissioner and murders that involve Masonic symbolism. Your musical Masonic esoteric interlude of the week. If you know Swedish, come sing and dance along to the Pythagoras Swing! I'm flying to Denver for Columbine Lodge's Colorado Night. The WM tells me the show will go on, even if they are predicting 24 inches of snow by Saturday night. It's 70 everywhere else in the country today. Even in Canada it's 70. How can this be? Didn't you guys get the memo, no snow after Tax Day? BTW, here's a plug for a service that is so cool I can't stand it. Tripit is set up so you forward your email confirmations of airlines, hotel rooms, rental cars, etc, to its email address, and it puts it all into one place that can be accessed by your iPhone. All in order, organized by trip, and even plugs in flight status and check in links, plus maps directions to everywhere you're going. As disorganized as I am, I need all the help I can get. This year also marks the bicentennial of the birth of Abraham Lincoln, so there will be loads of Lincoln-related activities in Springfield to attend. Registration is just $55, and rooms at the host hotel are $94. Featured presenters include Rex Hutchens of the Scottish Rite Research Society, Ed Halpaus the Grand Lodge Education Officer of the Grand Lodge of Minnesota, Jonathan Barnes, WM of the Illinois Lodge of Research, and several Masonic Educators from Illinois. Check the Conference's home page for more information. I am proud to be a part of the Indianapolis Masonic Temple Board and to have the honor of serving with a talented group of visionary brethren who are dedicated to preserving and improving Indiana Freemasons' Hall. It is the headquarters of our Grand Lodge here in Indiana, along with lodges, York Rite bodies, OES Chapters, an AMD Council, and a DeMolay chapter. We'll be celebrating the 100th anniversary of the building on June 13th this year. The Board has been working to bring new residents and services to the building over the last three years. We are proud to announce that the Indiana Grand Lodge Library & Museum will be returning to Freemasons' Hall after a dozen years of languishing in Franklin. It is our hope, along with the library board, that its new location will make it a valuable asset to Masons and academic researchers. My friend and brother Nathan Brindle has just redesigned the website for Indiana Freemasons' Hall. Nathan and I have been friends for more than 30 years, and we joined Broad Ripple Lodge just over 10 years ago together. He has served as secretary for two lodges and belongs to three. He's a part of the officer's line in the Indianapolis Valley's Lodge of Perfection. He's the secretary/treasurer of The Masonic Society. And he's the secretary of the Temple Board, as well. He is truly a pillar of leadership and responsibility, which makes him unquestionably a glutton for punishment. That goes for Board President Jim Dillman, as well, who ends his third shift workday almost every day with another two or three hours in the early morning at the Temple. The new website features our brand new logo, which was designed by Bro. John Bridegroom. John is a talented artist and is responsible for the exquisite design of the Masonic Society patents. The Temple will be rededicated this year on June 13th, and Congressman Dan Burton, a member of Evergreen-Oriental Lodge #500, will be the keynote speaker at the rededication. 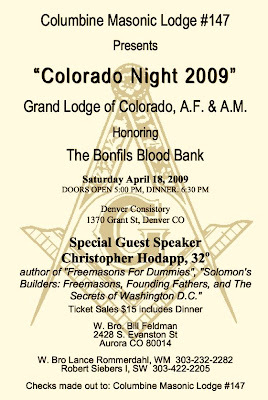 I will be the guest speaker at Columbine Lodge #147's annual "Colorado Night", April 18th, honoring the Bonfils Blood Bank. 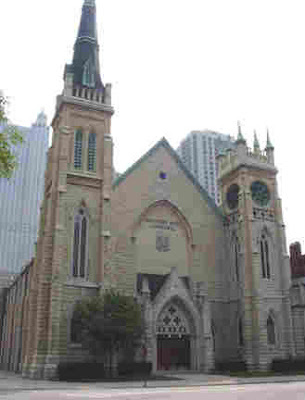 The dinner will be held at the Denver Consistory at 1370 Grant Street. I'm looking forward to seeing Colorado brethren! 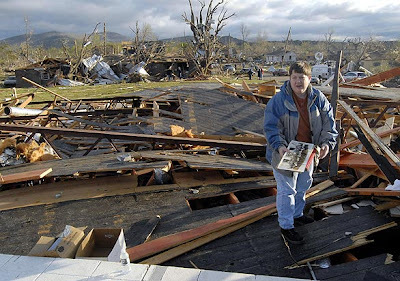 Little Rock's Scimitar Shrine Center is acting as a collection point for donated goods for the citizens of Mena, Arkansas who were struck by the tornado Thursday night. Noble Tony Francis is the contact at the Shrine Center, which is located off of I-30 and S. University on the service road in Little Rock. The number to the office is 501-565-5992. The Atlanta Journal Constitution has an article today that follows up on last week's news that the Shrine in considering closing six of its hospitals. It contains blunt talk about the dwindling of the Shrine's endowment and donations. Past Imperial Potentate and now Shriners' Hospitals CEO Ralph Semb is quoted as saying, “Unless we do something, the clock is ticking and within five to seven years we’ll probably be out of the hospital business and not have any hospitals." According to the article, the Shrine endowment fund has been dropping since 2001, but plunged in value from $8 billion to $5 billion in less than a year because of the stock market, as well as the nationwide drop in charitable contributions that has hurt most philanthropies. The Shrine is pulling $1 million a day from its endowment to balance the budget for the existing 22 hospitals. Semb said this year’s operating budget for the hospital system is $856 million. The budget has risen by $100 million each of the past two years while donation levels remained static, he said. The Imperial Session in San Antonio this summer will be asked to vote on the hospital closures. Such votes in the past have been contentious, and getting a 2/3 majority vote to do so may be well nigh impossible, in spite of the reality of the economic situation. Semb claims that to return to the kind of income from the endowment needed to sustain all of the facilities, its value must rise to $12 billion. An unlikely prospect in the best of times, which these are certainly not. 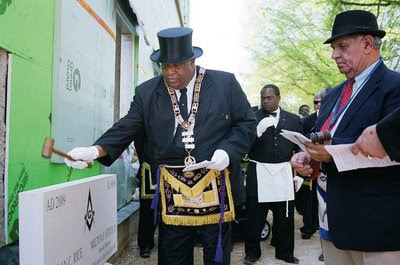 Meanwhile, sentiments continue to be divided evenly between those who think the Shrine would be better off eliminating its connection to Freemasonry, ending Masonic membership as a requirement, versus those who believe it would kill the organization. Dallas Lodge No. 128 in Mena, Arkansas, was destroyed yesterday after a tornado struck the building at about 8PM. One person was killed at the lodge, and at least two others in the mountain town. Thirty others were injured in the area. Homes were flattened, and the Mena courthouse was destroyed. Thousands remain without power today, and the national Guard is going door to door to check on residents. The Mena tornado's destruction hit Line Street the hardest. At the Dallas Masonic Lodge, the Order of the Eastern Star was having a meeting Thursday night when the storm came through. The 19 people inside only heard the tornado siren sound and say they had no time to take cover when the storm hit. Thurman Allen, 79, of Mena said a woman at the meeting was killed when the roof of the building fell in. He said rescuers had to cut the roof away to recover her body. Authorities have not released names of the dead. Allen said that as the tornado hit the lodge, debris hit him in the head and knocked him to the ground. His wife, sitting nearby in a chair, was thrown to the floor. The storm knocked over the lodge's cinder block wall, bringing down wooden roof joists, insulation and shingles over the people gathered for the meeting. Fred Key, 37, of Mena said several people were injured as the winds blew through the hall. He said the winds took the shoes of some of the members. Key says rescuers arrived as quickly as they could but were blocked by pine trees that fell across roads in the area. No word yet today on the name of the OES member who was killed. Dallas Lodge in Mena was the mother lodge of Norris Goff and Chester Lauck—long forgotten today, but better known in the 1930s as the comedy team of "Lum and Abner," one of the most popular radio shows on the air between 1932 and 1954. • Anna True Cress, 84, killed at the town's Masonic Lodge, where she was attending a meeting of the Order of the Eastern Star. • Judy Lobner, 47, who died in her daughter's home. Myhand said Lobner's daughter was outside the home when the tornado hit, but survived. • Albert Shaw, 61, who died when his two-story home was hit by the storm and collapsed. The twice-monthly meeting of the Mena's chapter of the Order of the Eastern Star had been going on uninterrupted, the 19 people inside only faintly hearing the sirens through the building's cinderblock walls. Attendee Thurman Allen said they were ready to get out of the building when the twister hit. The storm tore down the Masonic hall's walls, collapsing the roof on one woman, Anna True Cress, killing her. The winds pulled the shoes off some women who were at the meeting. Comcast has major issues at Hodapphaus. If you've sent me an email since the weekend, I haven't been able to answer. Hopefully, the Comcastniks will be here today to fix the problem. Curiously, my hotel in Savannah (also served by Comcast) had its entire cable/internet/ phone system knocked out early Sunday morning. It was just like being home. The new Grand Master of Minnesota, Thomas G. McCarthy, has issued a very detailed edict concerning the resolution passed at last week's Annual Communication about West Virginia. For a series of well documented reasons, he has declared the resolution null and void. The edict is followed by a 13 page memorandum. I urge anyone interested in this ongoing saga to read the edict and memorandum in their entirety. 1. The report of the Grand Master of West Virginia, as printed in the official proceedings of the annual communication of that sister grand lodge, contains information which, if true, could justify the Masonic discipline of Frank J. Haas and others. 2. The Grand Lodge of Minnesota has no means by which to evaluate the credibility of the competing parties to this dispute in the Grand Lodge of West Virginia, and thus has no means to determine the truth. 3. It was alleged, as a basis for the resolution that Frank J. Haas and others were not afforded due process or the right to appeal from the edict of the Grand Master. The proceedings indicate that such appeals, as well as a petition for reinstatement by Frank J. Haas, were duly considered at the 2008 Annual Communication of the Grand Lodge of West Virginia. 4. The information contained in the proceedings of the annual communication of the Grand Lodge of West Virginia was not available to the voting members of the Grand Lodge of Minnesota present at the time the resolution was proposed and adopted. 5. As the Grand Lodge of Minnesota has no legitimate manner to determine the truth of the dispute, there are no instructions that the Grand Master can provide to the Grand Lodge of Minnesota Committee on External Affairs to enable that committee to comply with the instructions contained in the resolution adopted at the annual communication. The resolution is attached to this Memorandum as Exhibit A. The External Relations Committee has been charged with a task that is impossible to complete. 6. The resolution, itself, is so vague that it fails to give sufficient guidance to the External Relations Committee, the Grand Master or the Grand Lodge to comply with its terms. The last five pages are quoted from the proceedings of the Grand Lodge of West Virginia and include PGM Montgomery's explanation of the episodes involving Frank Haas' expulsion. Again, I recommend reading this entire document. I like Frank Haas, and I consider him a friend. I think he is a good man who tried very hard to right many wrongs in West Virginia. But Masonry has rules, and I cannot find fault with GM McCarthy's reasoning for rescinding the resolution of Minnesota. If I read the report of WV's Grievances and Appeals Committee properly, they did not act on his petition for reinstatement because he had not yet been expelled for a year when they met in 2008. According to the report, he may repetition in 2009. Frank's civil case slowly creeps through the courts, but I suspect if the judge discovers that he has not yet completely exhausted the appeals process within the fraternity, it will undoubtedly be further delayed until he has done so. Moreover, many have heard Frank's side of this situation, but few have heard PGM Montgomery's, until now. That's no way to fairly "judge with candor, admonish with friendship, and reprehend with justice." Either inside or outside of West Virginia. The Shreveport Times in Shreveport, Louisiana is reporting that the Shriners Hospital there may close. It is one of a total of six that the Shriners trustees have identified for possible closure this year. The 89 year old Shreveport hospital was the first Shriners children's center opened, in response to a polio epidemic that swept across the US in the early 1920s. The article quoted national trustees chairman Ralph Semb as saying the board faces a major income shortfall this year, due partially to a drop in donations, but largely because of the plummeting stock market. The trustees were directed three years ago to try to increase the $8.5 billion hospital endowment to $14 billion. When the stock market fell, however, the investments plunged to less than $5 billion by this month. Along with Shreveport, the other hospitals potentially on the chopping block are Galveston, TX; Greenville, SC; Spokane, WA. ; Erie, PA.; and Springfield, MA. The closings will have to be approved by a 2/3 majority vote at the Imperial Session in San Antonio, July 5-9.